Inspired by living along the ocean, meadow, and redwood forest my mission is to create pure landscape scents that capture the memories of our most intimate experiences in nature where we luxuriate in olfactory pleasures of each season. It is my hope that my simple parfums bring you to a happy and deeper connection within your self. Perhaps there are shared memories with loved ones that will be conjured and an enhanced ability to rejuvenate from our day to day routines. I invite you to create your own personalized scent journey beauty rituals by layering our soliflore parfums, serums, flower waters and sipping our herbal tisanes to bring balance into our fast and busy paced lives. We need to slow down and embrace our me time. This is truly at the heart of any fountain of youth regime. All botanicals are sourced ethically & are organic or wildcrafted. We love supporting small wildcrafters along the California Coast, farmers, and small herbal producers. No animal testing, No phalates, No parabens, Nothing except organic ingredrients. Simple is better. 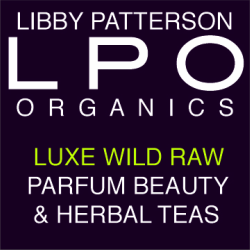 "I am a big fan of Libby Patterson Organics for many years. I started with delicious scents of Abracadabra, Light as a feather, Russian leather, Kali. It was a long journey through scents and I am absolutely enchanted by the effect it has on me. Libby is a cosmic, wise, and deep spiritual woman. I was honored to have a several aroma sessions in her little house in woods and it was like teleportation to a new world. Dont miss ever this opportunity to meet Libby and her perfume journeys if you are in California." It is reminiscent of a very famous, classic scent yet still retains the magic of all that is Libby Patterson Organics. Unlike the famous classic scent, I can wear Her Majesty, and all of Libby's scents, without any ill effects. I personally have allergic reactions from synthetic based perfumes, no matter how high the quality. Wearing this makes you feel like a queen, and you can almost be guaranteed no one else in the room at your next soiree with be wearing a handcrafted scent by a master perfumer! It's the simple things in life that can make you feel like royalty." "I just had a second private perfume class, one on one with Libby at her dream studio. I can say that I look to her as my perfume mentor. She weaves spirit, nature, and cosmic energy into a concrete perfume class. Being organic in flower/plant formations is important to me, and she's changed my views on many levels by being simply organic. She not only instructs on olfactory, but eases and builds on your identity as a perfumer. She really comes from the heart of her natural surroundings of the Slow Coast. I enjoy my journey to her studio. Driving through highway 1 prepares you by winding your senses down to the rhythms of the sea and mountains. It's all there around you before you settle into class." "I love the BIG SUR & OCEAN WHISPER perfume. Very unique scents - Libby is a modern alchemist. With Love from Germany, Barbara"
"I just purchased 2 spray perfumes, Jasmine Sambac and Coastal Woods, at a Makers Market in Santa Cruz.. I had a hard time deciding because I was immediately drawn to Honeysuckle. As always, my go-to is anything sweet and floral. But for some reason, I couldn't get past how much I was drawn to the Coastal Woods and how accurately it smelled like the Coastal Redwood Forest to me. It turns out, it is the fragrance that I wear the most! I spray it every time I walk past the bottle in my house. I LOVE these products by Libby Patterson and I look forward to purchasing more in the future."